One of my most amazing friends helped in the planning of my bachelorette party last fall and for the hotel room, she made us treats! The thing that everyone loved the most was the homemade marshmallows. They were so good! 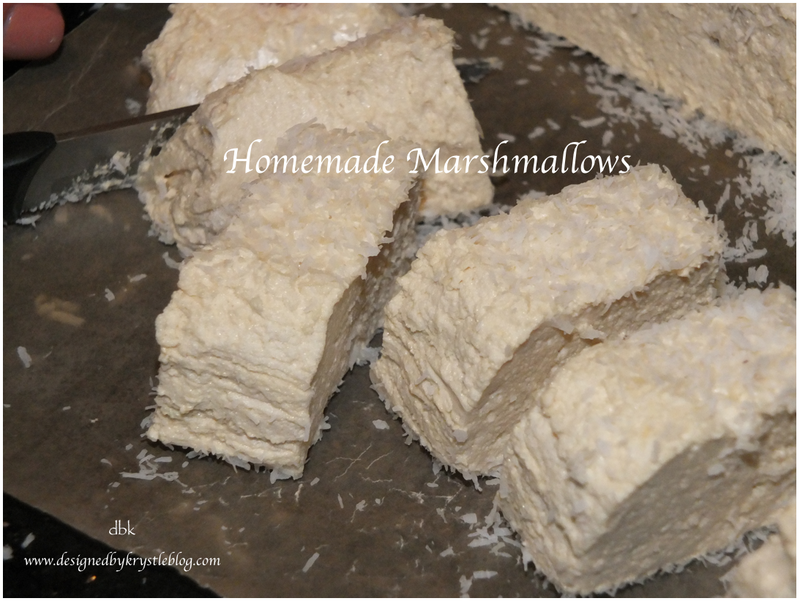 When I started thinking about this winter series and fun activities to do through the colder months, I knew I had to try my had at making marshmallows, so I scoured PInterest for a good recipe, got the ingredients and began! I followed an awesome recipe by The Urban Poser and she even has a very helpful video tutorial to go along with it so I would definitely recommend linking over for the full recipe and post! Here’s a peek at my process. Overall I would say it was not only a mangeable project but it was a fun way to spend some time in and hubby was very pleased with the end result. One of the things I liked about this recipe was the use of honey. You can definitely taste the honey flavor coming through instead of a traditional marshmallow flavor, but I like them nonetheless. The other thing is that I didn’t (and still don’t) have a candy thermometer. To be honest, I’m not much of a baker, and I certainly don’t see myself getting all excited about making candies or chocolates, so for this activity I just used my freshly sanitized meat thermometer. And although it doesn’t go up high enough, I was able to figure out when the boiling honey water concoction was ready to mix in! The marshmallows came out great! They are a delicious winter treat and perfect to dunk in your cocoa after a snow day! Have you made marshmallows? It was easier than I thought and I can guarantee your family won’t be disappointed!